A med student travels to rural Virginia, home of a proud, lucid mature woman in the early stages of Alzheimer’s disease, with the aim of making a medical documentary to promote awareness of the illness. 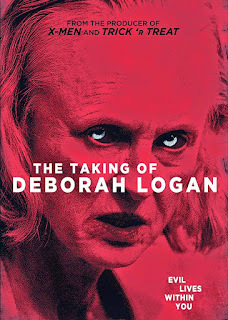 Deborah Logan (Jill Larson), strong and determined in her fight against the disease, expresses an insistence that she not be exploited while an array of cameras capture her deterioration. A horror movie based upon the concept of a weak mind (here, a woman in the grip of an all too real illness) being vulnerable to invasion from a vengeful supernatural entity. This Bryan Singer production draws powerful parallels between the terrifying decline of Alzheimer’s patients and the kind of paranormal horrors familiar from possession-based movies, as Deborah talks in tongues and pukes earthworms while her doctors insist there is nothing demonic at work, just the cruel machinations of her illness. As with THE EXORCIST, the most horrifying moments of THE TAKING are those depicting the medical procedures that dehumanise the protagonist as much as any of the more overt horror tropes. The “found-footage” techniques are employed with great skill, with the documentarians portrayed as deliberately unsympathetic, while Jill Larson is astonishingly good in the title role. Every frame is infused with a sense of dread as it builds to a nightmarish, claustrophobic climax, and there are moments of true alarm: none more so than the harrowing sight of Deborah, naked and sobbing helplessly in a scene worthy of any non-supernatural drama.